I tried the Sugar Free at Canton and bought a small pack. I chewed through that bag in less than two days, so I ordered a med bag. I am ready to order a large bag already! Great stuff! Thank you! Great taste- won't miss the sugar! We purchased this sugar-free jerky at Trade Days. We were so excited to finally find a sugar-free beef jerky! The taste is GREAT! 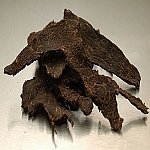 The jerky has such a nice meaty taste that it doesn't need any sugar, and the texture (sugar is often used for tenderizing) was also fantastic. Just wish we had bought more, my son ate it all before I had a chance!